Product prices and availability are accurate as of 2019-04-17 15:58:21 EDT and are subject to change. Any price and availability information displayed on http://www.amazon.com/ at the time of purchase will apply to the purchase of this product. 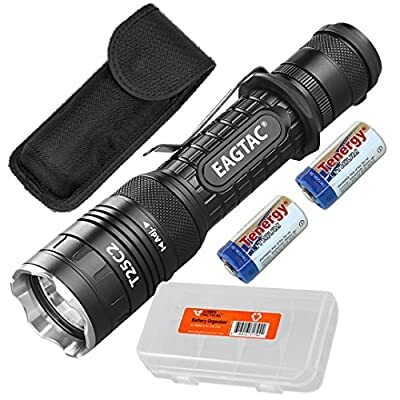 The EAGLETAC T25C2 PRO is a high performance compact flashlight which utilizes a CREE XHP35 HD LED capable of a blazing 2000 lumens and 317 yards of throw, making it a great tool for searching indoor and outdoor environments. 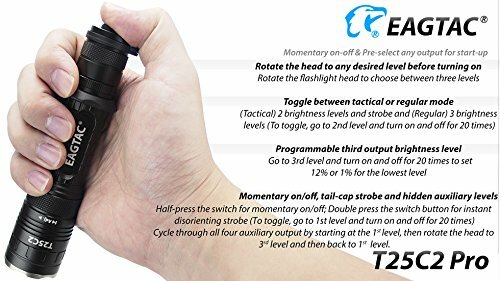 A rotatable head allows users to quickly switch brightness levels-even while the flashlight is off! Multiple programmable and extra modes allow customize output settings to suit individual needs. The flashlight is powered by one 18650 battery or two CR123A batteries. 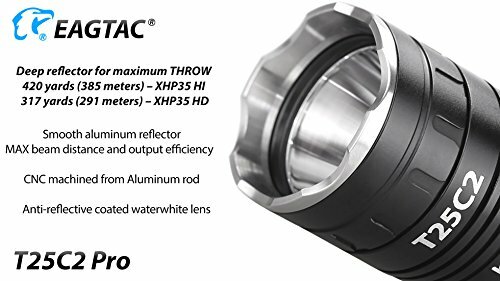 The HAII hard-anodized aero grade aluminum and IPX8 rating ensure that the flashlight is safe from accidental drops on hard surfaces like concrete or wet areas like water puddles. The inclusion of an attachable flip-cover diffuser provides soft diffused lighting for reading maps or other materials, making this a great light for tactical, searching or emergency applications. 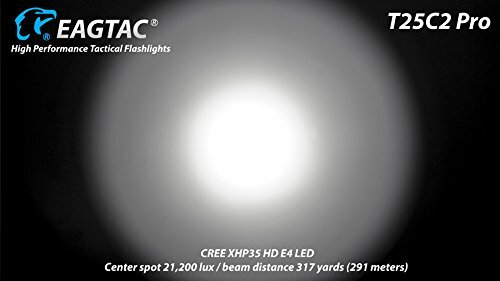 SUPER BRIGHT TACTICAL LIGHT - The CREE XHP35 HD LED produces a blazing 2000 lumens max. EASY TO USE AND PROGRAMMABLE - A rotatable head allows you to quickly change brightness levels-even when the light is off! Multiple programmable and extra modes allow you to customize the flashlight for tactical, searching, emergency applications and more. 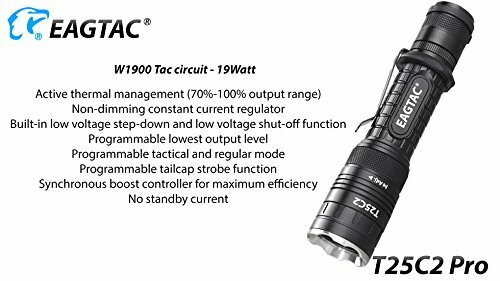 BUILT FOR TACTICAL USE - HAIII hard-anodized aero grade aluminum construction combined with additional design elements like a crenulated stainless steel bezel and tail cap battery stabilizer allow the flashlight to withstand impacts. FLIP COVER DIFFUSER FILTER - The included diffuser filter easily attaches to the head of the flashlight to allow users to quickly change between a hard spotlight style light and a soft diffused light which spreads light more evenly making it a great addition for up close uses like reading maps or books. 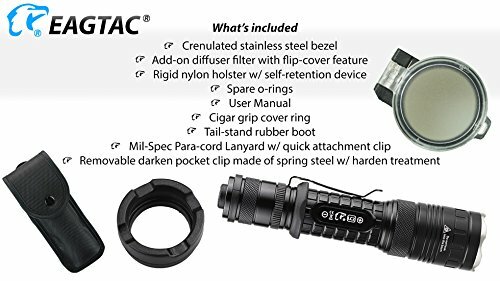 "PACKAGE CONTENTS - T25C2 Pro Flashlight, Diffuser Filter with Flip-Cover, Holster, Spare O-Rings, User Manual, Cigar Grip Cover Ring, Tail-stand Rubber Boot, Lanyard w/ Quick Attachment Clip, Pocket Clip, 2x CR123A Batteries, Lumen Tactical Battery Organizer "